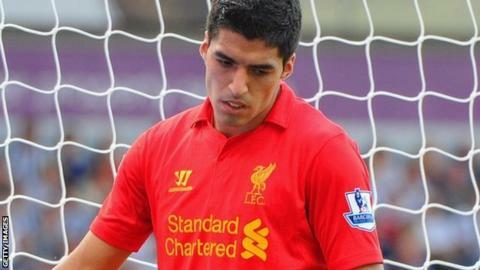 Luis Suarez cannot deliver the goals Liverpool need to propel them to success, says Gary McAllister. After a 3-0 opening day defeat by West Brom, McAllister said his old side must become more clinical in front of goal, or suffer like last season. But he does not think they can rely on the Uruguayan, 25, to do that. "Suarez is a fantastic player, but I don't know if he is a natural goalscorer, somebody like a Michael Owen," said the Scot. Liverpool missed several good chances at West Brom as Brendan Rodgers's first league game in charge ended in defeat. It will be small steps first. They have to get into the top six or seven first and then look to get back into the top four. "The players have got to put away the chances being created," former Reds midfielder McAllister told BBC Sport. "That was the big thing last year - an inability to put away chances when they were dominating games." Suarez was Liverpool's main culprit at The Hawthorns, spurning a number of opportunities. The forward scored 11 goals in 31 league outings last season and has 21 goals in 54 appearances since joining from Ajax in January 2011 for £22.7m. McAllister said: "I can see him chipping in with a good amount of goals but is he somebody who is going to get 25 plus? I'm not so sure. "But that's me being hyper-critical as he brings so many other things to the game, like linking play and his technical abilities are fantastic. "Liverpool certainly have to be more clinical with their finishing. Looking back to last season, I can just picture a lot of openings where players were snatching at the chances or trying too hard when they just needed to let it happen. "I worked with Stewart Downing and he has never scored a league goal for Liverpool. He's got two great feet and very capable of getting himself into double figures as far as I'm concerned." McAllister said Rodgers needs time to implement his philosophy and Liverpool fans should not raise their expectations too high as their new manager tries to restore them to former glories. "In terms of dominating the league and winning European Cups, that is a long way off," he said. "It's a big ask to say that he can do that in the next couple of years. It will be small steps first. They have to get into the top six or seven first and then look to get back into the top four. "I think top four is possible in the next two or three years but the manager has got to be given time. There have been too many changes in recent years and they have got to stick by this guy. "A good season for Liverpool would be getting into the top six. It would be an outstanding season if they managed to get themselves back into the Champions League." Liverpool face Manchester City, Arsenal and Manchester United in three of their next four league games. "It's a tough start but it will give them a good indication of where they will be," said McAllister, who was a guest on BBC Radio 5 live show. "Those games tend to take care of themselves. Liverpool don't have a problem in those games because of the type of club it is - it raises itself for those games. There's no need to panic."